It is not by chance that Indian musical traditions have always been passed on orally in a high strung rigid grammatically packed taleem, shikshya in designated schools of gayaki and dance styles. But it has to culminate always in a rasika embracing stage performance where what you have learnt is passed through the lens of the onlooker who is receiving the thought you are projecting on stage. Aditiji started in the golden era of Kathak Kendra as a leading student of Pandit Birju Maharaj in 1982 descending from Ahmedabad. A plethora of shows and accolades demonstrated and allowed Aditiji to form the foundation to include many promising dancers into her fold. She had virtually trained only four dancers Anindita, Gauri, Rachna and Rashmi Uppal. All the dancing years have gone in conceptualizing new themes and performances. The focus is to shift to assess the performing repertoire of the group of students and next generations of artists. The big question after many concerts arose as to why should we not have a space where young talents perform and sustain their art? 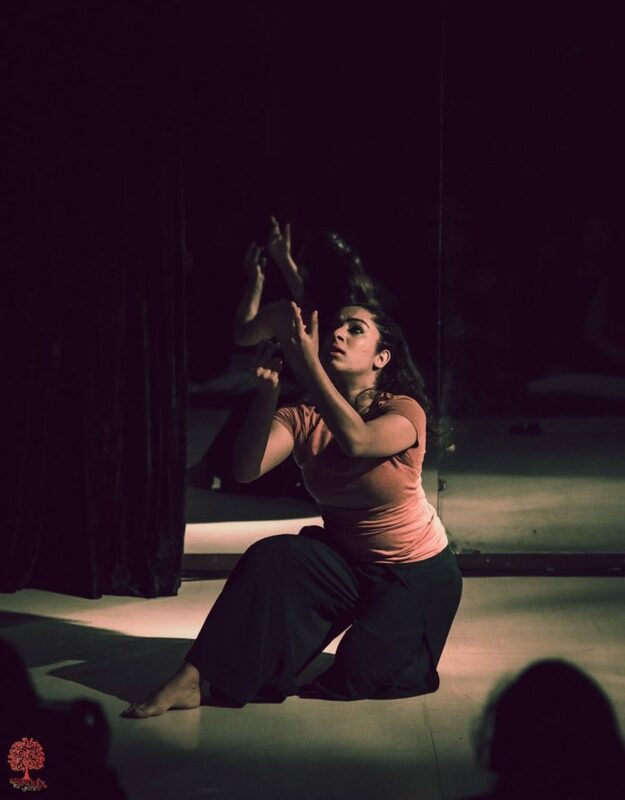 The Drishtikon group brainstormed and wanted to establish the space as performing space as it was basically used for rehearsals by the performing group and repertory. The idea was to use the space for periodic showcasing of the talents. The India Heritage desk collaborated with the Drishtikon Foundation in this venture. Aamrapali Bhandari followed it up with a stunning debut in pure kathak and abhinaya. She demonstrated her firm training and solid acting prowess in her depiction of Radha Krishna. Adapted from a text by Jayadeva’s gita govinda the dance was interspersed with verses in translated Hindi. “Naina se naina mile” took you to the ethereal love of oneness between Krishna and Radha. Radha the epitome of pure love and Krishna the paramour to many damsels. Aamrapalli also displayed her skills in contemporary dance in a voice support with Mehar Bhandari. The journey of the soul to a mirror image of what you set to achieve was the mainstay of the piece. She played all contemporary stretches to the best of her ability and ended the piece in an English narration of her presentation. Both the pieces were choreographed by the young dancer herself. After a 15 minutes break, one got a view into a joint Bharat natyam and Odissi Solo by Sooraj Subramaniam from Belgium. A dexterous mover and excellently poised Sooraj began with a padam in Bharatnatyam style by Muthuswami Dikshitar, MamaviMeenakshi is a song describing and praising Lady Meenakshi – warrior goddess of city of Madurai – often depicted holding a parrot. Pallavi in Raga Kalavati is a pure Oddissi dance followed by a short, expressive song as an ode to Krishna. “Sangini re chaha” choreographed by Deba Prasad Das and passed on to generations of Odissi dancers all over the world. This was followed by a Bharatnatyam piece Aduvumsolluval which show the protagonist venting her frustrations over that ‘other woman’ who appears to have ‘stolen’ her man. The recital ended with Moksha, a short, pure dance depicting joy and release in Oddissi. Since the space and resources was limited the performance ended with all recorded music by Sooraj. A face to the world of Indian dance for India from abroad this will be a real pleasure to watch for years ahead. The dance leaves you with rims of experiences and insights to the world within.